Xavier University was founded in 1831 as a Catholic men's college, the Athenaeum, in downtown Cincinnati, adjacent to St. Xavier Church. Cincinnati's first bishop, Edward Fenwick, dedicated the school to St. Francis Xavier on October 17, 1831. In 1840, Bishop John Baptist Purcell asked the Society of Jesus to take control of the school and the Jesuits changed the name to St. Xavier College to reflect the school's patron saint. Xavier University was the first Catholic institution of higher learning in the State of Ohio. Xavier is also the sixth-oldest Catholic university in the nation and one of 28 Jesuit Catholic Colleges and Universities in the nation. The Core Curriculum of Xavier University, totaling 64 credit hours, serves to embody Xavier's mission through traditional Jesuit education. Along with courses required by their major, students take courses in Theology, Philosophy, English Composition, E/RS, Fine Arts, Foreign Languages, History, Literature, Cultural Diversity, Science, Mathematics, and the Social Sciences. Literature and the Moral Imagination, and an elective concerning with socially significant issues. The goal of E/RS is to give Xavier students the tools to recognize and understand social issues from a perspective of the humanities. Catholicism and Culture is a minor available at Xavier University that studies Catholicism and its various embodiments throughout time and the world. The minor consists of 18 credit hours, which are composed of courses studying the Catholic Religion, its variations, and how it affected society across the ages. The Peace Studies Minor is a 15 credit hour program focusing on war and social conflict, and strategies for conflict resolution. The minor studies peace and conflict, social justice and ecological sustainability. The Center for Catholic Education works with Xavier University to promote Xavier's Catholic tradition by assisting other Catholic schools in the development of Catholic education. Maintaining a partnership with the Archdiocese of Cincinnati, the Center helps other Catholic schools by developing rigorous and effective curricula while promoting academic excellence in such courses. 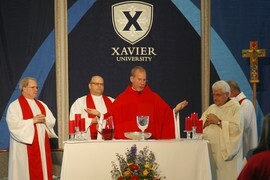 The Mass of the Holy Spirit, also known as The Spirit Celebration, is a traditional Mass that has been held annually at Xavier University since 1840. Held on the Husman Hall Stage, on the Xavier Yard, the Mass celebrates the start of a new academic year at Xavier University. Fr. Michael J. Graham, S.J., President of the University, presides over the liturgy. Following the Mass there is a community picnic and celebration. Baccalaureate Mass is a traditional liturgy held prior to commencement that serves to celebrate the completion of a form of higher education. At Xavier, the Mass is held in the Cintas Center arena, the place where graduating seniors began their journey at Xavier as first-year students. University President, Fr. Michael J. Graham, S.J. presides at the liturgy. Times for Adoration, Reconciliation and other opportunities can be found by clicking here. The 10pm Mass Committee is a group which meets weekly to discuss the readings for each Sunday's Mass. The Committee also coordinates many volunteer ministries and helps prepare for the various liturgical seasons throughout the year. Catholic Ministry Team gives students an opportunity to explore their own Catholic Identity by entertaining questions that deal with appropriating Catholicism while creating dynamic programs and opportunities for their peers to grow and be challenged. The Catholic Ministry Team holds several programs designed for students to further their faith such as "Faith and Film", "Theology by the Slice", and "Tea with the Saints". Life After Sunday is a club that provides students with multiple ways to apply their Catholic Faith to everyday life situations. The club offers group prayers, Bible study, and Eucharistic Adoration in weekly sessions. Life After Sunday also hosts Lord's Day dinners and Holy Power Hour. The club meets weekly to plan upcoming events and discuss new information. Athletes In Action is a club organized for student athletes to further connect with their spirituality. The club is designed to make athletes mentally, physically, and spiritually stronger. The club meets weekly on Wednesdays at 9:15pm-10pm in the Gallagher Student Center. Navigators is a Christian club organized to help students get more in touch with their faith. The club plans retreats, road trips, bible studies, ultimate Frisbee games, and other social events. Navigators meets weekly on Thursdays at 7pm in Kelley Auditorium, located in Alter Hall. Students Committed to Christ is a club designed to bring together the campus community for prayer, faith discussions, support, and bible study. The club reaches out to spread the gospel of Jesus Christ by performing various service projects, activities and programs. The club is open to all who are seeking to provide valuable service, regardless of faith. Students Committed to Christ meets every Friday from 6:30pm-7:30pm in the CFJ Loyola Room, located in the Gallagher Student Center. Bellarmine Chapel is a Catholic congregation located in the heart of the Xavier University Campus. The Chapel is a parish of the Archdiocese of Cincinnati, but preaching and mission is largely influenced by the spirituality of St. Ignatius. Founded in April of 1927, the parish served a small neighborhood of Cincinnati while also providing opportunities for priestly ministry for the Jesuits at Xavier University. The present Bellarmine Chapel was constructed in 1962, and before then Mass was held in Schmidt Hall. 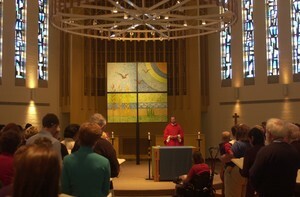 In 2004, Bellarmine Chapel was renovated with the guidance and expertise of local artist and designer William Schickel. The parish is very involved in the community, hosting multiple outreach and service programs. Since 1840 when the Archdiocese of Cincinnati asked the Society of Jesus (the Jesuits) to take responsibility for the University, Jesuits priests, brothers and scholastics have served in a number of capacities. Xavier has had 34 Jesuit Presidents who have guided the school through its challenging early days, its move to its current location, and through times of rebirth after World War II. Xavier's current President, Fr. Michael J. Graham, S.J. came to Xavier in 1984 and during his tenure here has taken on many challenging roles. He served as a faculty member in the department of history, vice president for university relations and special assistant to the President. In January 2001 he took on his biggest challenge to date by becoming president of Xavier University. He is overseeing a historic time at Xavier including a 40% growth in the student body and the construction of state-of-the-art learning environments. During his tenure, Fr. Graham has further strengthened Xavier's dedication to providing a strong, Jesuit Catholic education with a reinforced commitment to academic excellence, community collaboration and Xavier's mission of developing men and women for and with others. Today, Jesuits serve in a variety of roles on campus including as campus ministers, administrators, and professors in several departments including Theology, Philosophy, History, and Math. They celebrate daily Mass and preside at student Masses twice on Sunday. Religious artwork can be seen throughout Xavier's campus. The Williams College of Business Undergraduate Office and the Center for Mission and Identity display original Ignatian-themed artwork by local artist Holly Schapker. Statues of Mother Theresa, St. Francis of Assisi, Quo Vadis, St. Ignatius Loyola, St. Francis Xavier, St. Robert Bellarmine, and Mary, Queen of Victory and Peace grace the various lawns and building entrances throughout campus. Most recently a new statue of St. Francis Xavier has been installed at the campus's main entrance. There is a hand-crafted cross in each classroom. Each is designed by the local artist David Camele.